Ultraviolet (“UV”) light is one of the frequencies of light that is given off by the sun. Ultraviolet light is not visible to the human eye; it is an invisible part of the “electromagnetic spectrum”. Ultraviolet radiation, visible light and infrared energy are all given off by the sun. The image below shows the electromagnetic spectrum, which includes ultraviolet, infrared and visible light along with other types of energy. 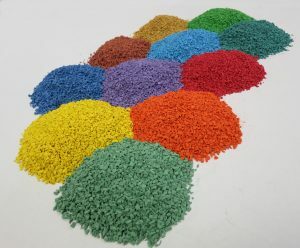 Some colors of wet pour surfacing are more prone to higher levels of degradation from UV (ultraviolet) light exposure. This means that certain colors in the manufacturing process of the rubber can fade over time because they have been exposed to ultra violet radiation from the sun. Generally speaking, the brighter colors are more prone to UV Degradation and during this process the sunlight radiation attacks the synthetic polymeric within the EPDM material, leading to a loss of the original vibrant color. Color is simply defined as the light of different wavelengths and frequencies. Light, however, is just one form of energy that we can actually see that is made up of photons. Colour comes from light. We can see even main colours of the Visible Spectrum. The retinas in our eyes though have three types of colour receptors in the form of cones, we can actually only detect three of these visible colours – red, blue and green. These colours are called additive primaries. It is these three colours that are mixed in our brain to create all of the other colours we see. The wavelength and frequency of light also influences the colour we see. The seven colours of the spectrum all have varying wavelengths and frequencies. Red is at the lower end of the spectrum and has a higher wavelength but lower frequency than that of violet at the top end of the spectrum which has a lower wavelength and higher frequency. To physically see this, we need a prism. When light from the sun passes through a prism, the light is split into the seven visible colours by refraction. Refraction is caused by the change in speed experienced by a wave of light when it changes medium.